I teach a class called Family Inventors’ Lab. The shortest way to describe the class is “STEM Enrichment for ages 3 – 7.” But if I describe it that way, and then mention that we do a rhythm activity to open every group time, and that we teach a new theme-related song every week, some folks will ask how music fits in to STEM. First, let’s broaden out STEM to STEAM – Science, Technology, Engineering, ARTS, and Math. Not only do we include music, we also include other arts: painting, sculpting, collage, print-making, plenty of opportunity for imagination / dramatic play, and a fictional story designed to inspire the imagination. If we’re raising the “inventors of tomorrow”, then imagination and creativity are just as important as knowledge of science facts and mastery of science process skills. 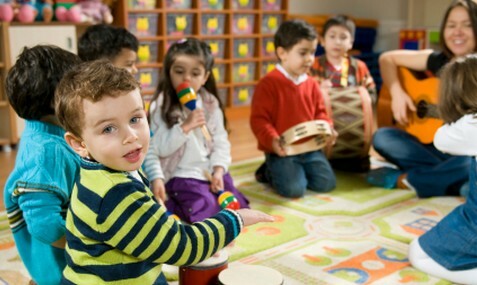 Second, let’s talk about rhythm and music and how they help kids to learn academic skills. Language – beat, rhythm and pitch are all a part of language, so music and rhythm activities help a child develop speech, communication and language skills. Auditory processing – music lessons help kids respond to sound more quickly, distinguish between sounds better, and pay attention to sound, all of which aid in classroom learning. Memory – kids with musical training have better memories for words, lyrics, and numbers. Academic success – children do better on standardized tests and in school performance. As a comprehensive learning experience, we want to give our students some music exposure to get a small dose of these benefits. You can see the details of the research here. And learn more about the benefits of music in this post. Third, let’s talk about how rhythm helps kids learn how to use their bodies effectively. When we use our bodies well, we have rhythm – we walk in rhythm, chew in rhythm, and breathe in an even rhythm. Rhythm helps with playing an instrument, dancing, jumping rope, rowing a boat, or bouncing a ball. It helps us to speak in conversational rhythm without stuttering. When we use tools with our bodies, it helps to have rhythm – when we hammer, use a saw, beat eggs with a whisk, cut with scissors, typing on a keyboard, and many other tasks work better when you’ve got an even rhythm. So, the rhythm ties into the T in STEM – T for Technology and for Tools. The ability to keep a steady beat is not completely instinctive. (Source) It is something we need to learn. Note: the Music Connections blog has some great resources on teaching rhythm to babies and toddlers. Within the rhythm of our class, music serves many roles. Gathers attention. At the start of group time, the kids can be really scattered. Doing a rhythm activity together helps them to center themselves, get focused on the teacher, and let go of other distractions. Reinforces key ideas and increases retention. We have a science themed song each week. Many, though not all, of our songs help to reinforce key ideas about the topic we are learning (such as the States of Matter song, or the Simple Machines song), and some help apply and remember ideas (like the Habitat Song and the Rainbow Song.) At the end of the year, we reprised some of the songs we had learned, and it was fascinating to see how many the kids remembered. Fun. Many of our songs are just fun to sing, and make us all happy – parents, teachers, and kids. We know the kids learn more when they’re happy.